This is story of a man and his journey in WWI and the way he has come to symbolise the service and sacrifice of the original ANZAC’s in a distant English town. Sgt Thomas Hunter was born and raised in Medomsley, County Durham in 1880. He became a coal miner at the early age of thirteen and later, served 10 years with the Durham Artillery. Thomas migrated to Australia in 1910 and initially lived with his Aunt and worked as a miner, in the Hebburn Colliery at Kurri Kurri and later at Broken Hill. When WWI broke out, he was a part of a contingent of over 50 men that travelled from Broken Hill to Adelaide and enlisted in the 10th Battalion AIF, their regimental numbers ranged from 477 to 543; Private Hunter was allocated the number 505; the man behind him in the enlistment queue, was 506 Private Reginald Roy Inwood who in September 1917 would be awarded a Victoria Cross for his valorous actions at Polygon Wood. He was the second of three men in the “Fighting 10th” to receive the VC; the first being, Arthur Seaforth Blackburn and the third being Philip Davey MM. In October 1914, Thomas sailed to Egypt with H Company, 10th Battalion aboard on HMAT Ascanius A11. Here they underwent training for active service. As the 10th Battalion along with its’ sister battalions the 9th, 11th & 12th of 3rd Brigade were the covering force for the landing on 25 April 1915, Thomas and his mates struggled ashore at 4.30am making them among the very first men to land at that small cove that would later forever bear their name ANZAC Cove. At the end of the first week, just a day before the AIF launched a major attack to extend their line, Thomas was severely wounded in the foot at and subsequently evacuated to Egypt. Thomas returned to his battalion at Gallipoli in June and was with them until they left the Gallipoli Peninsula for Mudros, in November. In accordance with the plan to expand the AIF, upon their return to Egypt the 10th like all battalions was divided equally in half to form other battalions and from the 10th the 50th Battalion was formed. Here the battalions were reinforced with men who had seen no action so after they were reorganised, rest and training were the order of the day. The 10th Battalion as part of the 3rd Brigade 1st Division was deployed to France and arrived at Marseilles in April 1916. In July they were moved into position to attack Pozières, an action which formed part of the Somme Offensive. This was to be their first action in France. The battle lasted from the 22nd to 25th of July. Unfortunately on the last day at Pozières Thomas Hunter sustained a severe gunshot wound to the back and was partially paralysed. He was taken to 13th General Hospital, Boulogne and then evacuated by H.S. St. Denis to England. There he was placed on a hospital train which was to take him to Halifax. Along the way when his condition deteriorated, he was taken off the train at Peterborough, Cambridgeshire, and there admitted to the local infirmary. Ironically, this was about 200 miles from where he was born; regrettably he died as a result of his wounds on the 31st July. 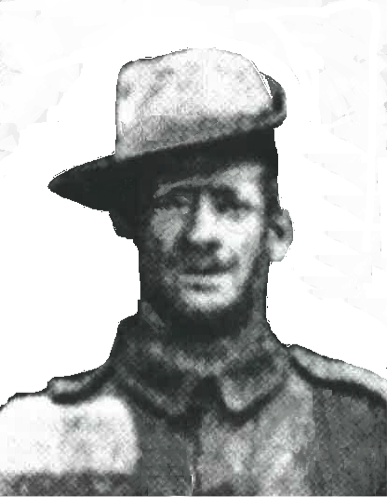 Sgt Thomas Hunter is thought to be the first ANZAC soldier to die on English soil and became known to the locals in Peterborough as “The Lonely ANZAC”. As Australians had only commenced serving on the Western Front, the people in England had not had extensive contact with them. The fact that this Australian from half a world away, had come to fight and die on behalf of England and the Empire deeply touched the local community. It also provided them with an outlet for the grieving of their own heavy losses. Community feeling ran high and the sentiment of honouring him and what he represented was led by the Mayor of Peterborough. As a result a funeral service with several thousand people in attendance took place with a horse drawn hearse, the cathedral bell tolling and with full military honours at The Broadway cemetery, on August 2nd 1916; all shops were closed during this sad event. After the funeral the grave was covered in countless wreaths and posies. 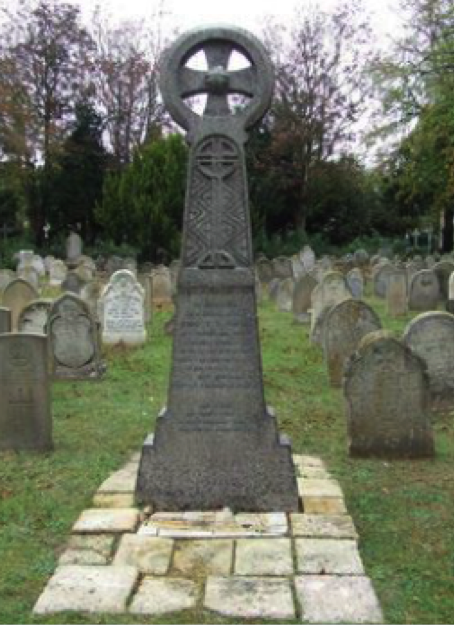 Eventually a three metre grey granite Celtic cross was installed and is the sentinel at his grave. 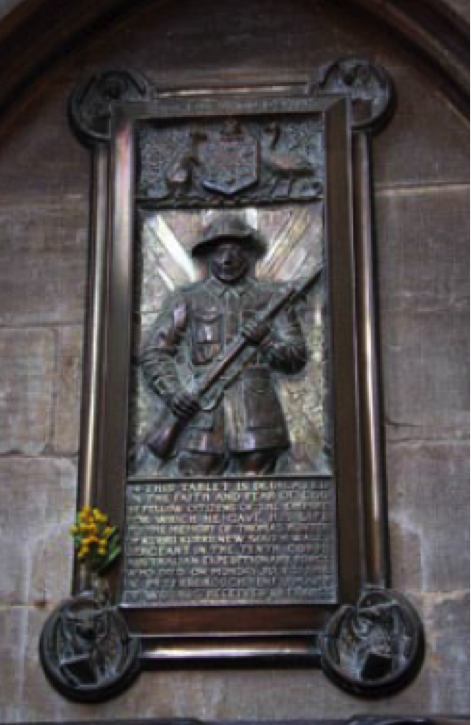 There is also a bronze plaque, measuring a metre in length and weighing over 1,000 kilograms; installed at the western end of the Peterborough Minster dedicated to him, part of the inscription reads “dedicated in the faith and fear of God by fellow citizens of the Empire for which he gave his life”. Both of these were installed in 1917 and paid for by the community of Peterborough through a public subscription promoted by the local paper, the Peterborough Advertiser. Such was the depth of feeling the locals raised 100 Guineas in ten days, a vast sum in those days. In December 1932 the Mayor of Newcastle NSW wrote to the Peterborough Council expressing his Council’s gratitude for the respect and spirt of remembrance accorded to Sgt Hunter by the people of Peterborough. He asked for a wreath to be laid at the grave and the local council immediately complied; the events were reported on the front page of the Peterborough Advertiser, with a poem by A G Darley dedicated to Sgt Thomas Hunter. Services continued to be held at the grave over the years though unfortunately grave fell into disrepair. 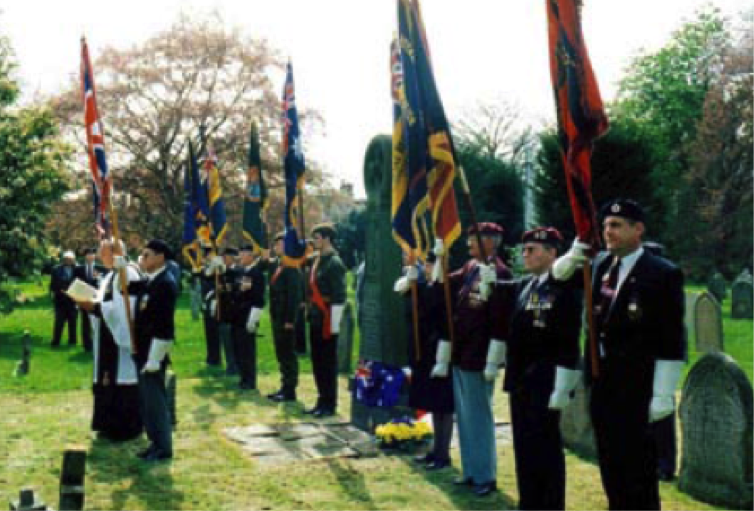 In 2000 it was restored and rededicated in a service organised by the local branch of the Royal British Legion. Through the efforts of local Peterborough resident and historian John Harvey, the remembrance of Sgt Hunter and what he represented received further impetus in 2003 when John researched the story and published a book; “The Lonely ANZAC: A True Son of Empire”. Now, every ANZAC Day a memorial service organised by the City Corporation is held at his grave, it is a solemn and significant occasion. As well as the attendance of the local citizens, notable attendees have included: The High Sheriff of Cambridgeshire representing Her Majesty Queen Elizabeth II; the Lord Lieutenant of Cambridgeshire; Australian Defence Force Personnel representing the Australian High Commissioner in London; Representatives of the New Zealand High Commissioner; the Mayor of Peterborough and other civic dignitaries; US Defence personnel; about Standard Bearers from Regimental Associations, the Royal Air Force, the Royal British Legion and cadet groups. Relatives of Sgt Hunter still reside in the Kurri Kurri area of New South Wales, Australia and were unaware of the significant story behind their great uncle’s death in WWI. Ron Warden from the UK, retired for a while to Australia and through the RSL Sub Branch at Kurri Kurri, managed to make contact with Thomas Hunter’s descendants and later met with them to present the material relating to his story. For the Centenary of ANZAC Service in 2015, Ms Jo Gainer, Thomas Hunter’s great-great niece attended the ceremony. An unusual side note is that according to local Peterborough legend, the infirmary in which Thomas Hunter passed away is haunted by his ghost. Some years ago, the wife of a Caretaker who lived on the premises saw the apparition of a man aged about 30 in a grey or green suit floating up the stairs towards her. He went right past her before then passing through a pair of closed doors then down a corridor at the end of which he completely vanished. It appears that Thomas Hunter still resides in the local Peterborough community which has so taken him to heart, in both body & spirit! Acknowledgements to: Ron Warden, Mike Seabourne, John Harvey and the RMPA Western Australia Branch for material which has contributed to this article.